The temperature at 6:15AM was 46.7F under a partly cloudy sky. Bob, Karen and Liam the pooch left for home at 8:15AM. They will be ten days or more getting home to Penetanguishene, Ontario. That name is quite a mouthful for sure. The Navy named one of the River Class Frigates after the place but cut the name back to HMCS PENETANG. She had international call sign CYTL and pendant K676 during World War II. After the war she was converted to a Prestonian Class Frigate and assigned pendant 316 and international call sign CYMD. Shortly after this conversion she was sold to Norway who renamed her DRAUG and assigned international call sign LBDG. 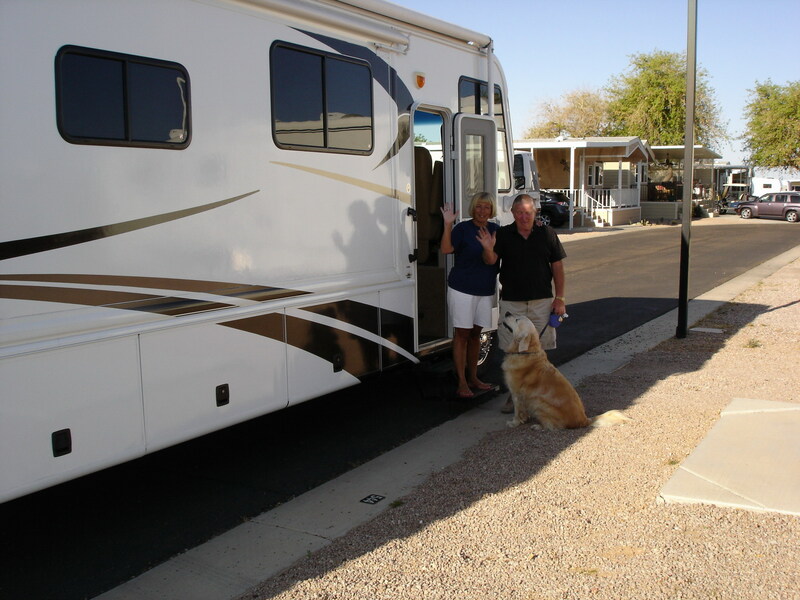 This is Bob, Karen and Liam the pooch leaving. They will be missed for sure. 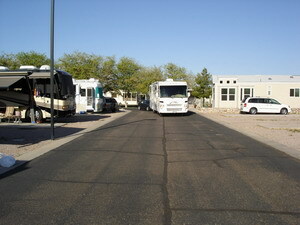 They plan to return to this RV Park this coming November to the same site for another four months. We were up to the last Monday morning meet and greet meeting this morning. We did not have a doughnut but there was a good lineup for them just the same. The meeting was not very long, about ten minutes that could have been condensed to five. We sat with a couple here from Quebec at the meeting. They are full timing it. They bought their fifth wheel trailer here in the United States and leave it here. They have a motorhome in Quebec for the summer. A great way to do it if one can afford it. Joan did laundry this morning. I drove her up and back home. It is way too far to carry that basket of clothes. The soiled laundry accumulates very fast. Monday morning is a very poor time to try and do laundry. The place was packed with everyone trying to get ahead of the other. There was nothing heard on or around 14023 kilohertz all morning. At 10:25AM the temperature was 71.1F under a clear sky. By 10:45AM the temperature was 72.6F still under a clear sky. At 11:30AM the temperature was 75.8F and the weather station stated it feels like 77F. Still under a clear sky. Still under a clear sky at 3:30PM and the temperature 87.0F with the weather station stating it felt like 80F. One wonders what they use to get this felt like answer. We heard a couple of stations on 14023 kilohertz during the afternoon but they were gone before I managed to get fired up to answer them. We spent the afternoon just reading, relaxing and sitting out in the sun. A great way to kill time. Bob and Sandy are right behind us and plan to leave for back home in Montana on Wednesday. Bob fired up the rig at 4:15PM. She is a big tandem axle motorhome fully air suspended, brakes and so on. Bob and Sandy live in it all year long. Here in winter and Montana in summer. She was one powerful sounding rig sitting there idling and the smell of burnt diesel fuel simply gave it a more powerful feeling. Bob spent his life installing electric power lines. The smell and noise made one think of a ship. I had a good chat with Valad in Sacramento, California, on 14023 kilohertz around 4:30PM. We had to cut the chat short while Joan and I went to the ballroom for the final supper. It was a good one. Steak, and one of the best steaks I ever ate. Corn on the cob, baked potato and salad. Chocolate chip cookies for desert. We sat with Mark and Sharon from Iowa and Bob and Jan from Michigan. The first time we had met them but a great bunch. Mark and Sharon want to come up to Nova Scotia and may try and get there this summer. This has to be one of the few places in the world where those from two different nations can get together and one cannot tell them apart. It is a great feeling and we had a few good laughs during this supper. 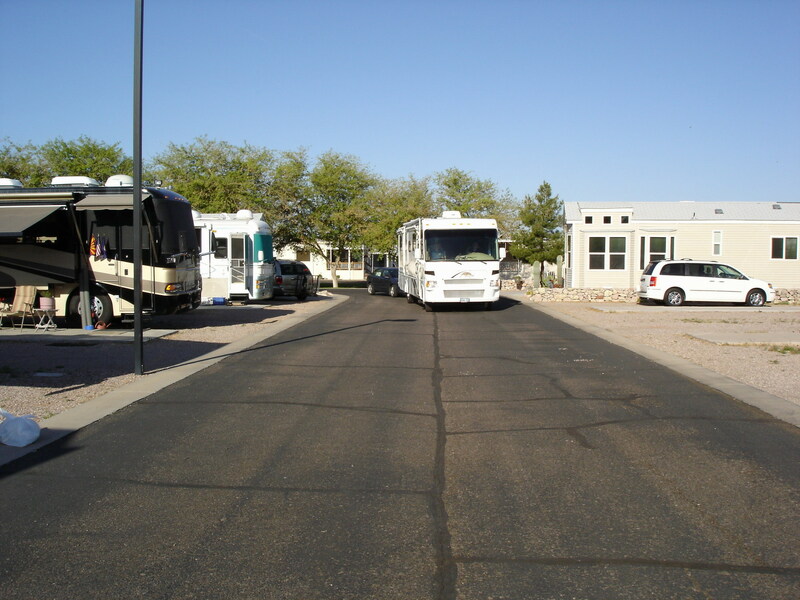 Joan and I returned to the trailer at 6:25PM when the temperature was 76.5F under a clear sky. The weather station said it felt like 77F and they were right on that. The sun was just setting in a typical clear sky sunset setting. The orange, yellow, green, blue line and then it got dark. There was no one allowed in the swimming pool this evening. Apparently some kid had an accident in the pool and they have to clean it, check it, flush it, whatever. Our day ended with the evening movie when the temperature was 67.3F with a clear sky. The weather station claimed it felt like 67.3F. And another good day was history.